The soft launch went well and to answer the Craigslist Question raised in the previous post, yes we brought people and made money in tips (more than we would have made for the same number of people playing a club with three other people on the bill. Farzad Golpayegani (the other guitarist in Korisoron) has been editing video and posting them (a thankless job the table he had the camera on had people talking the entire time so finding segments without conversation was difficult but he did manage to pull these together. Thursday, September 25th – Proctor’s GE Theatre (as part of Festival Cinema Invisible‘s kick off event) 7pm-10pm full information can be found here! We have an extra ZT Lunchbox Acoustic coming to us but we weren’t able to coordinate with ZT in time for the Moon and River gig so rather than having one great sound – we ended up going direct to the PA. While that isn’t the worst thing that’s ever happened in the history of the world, it was a drag to hear that piezo through a PA tone. (BTW – We are SO excited about the ZT Acoustic amps because they sound simply AMAZING). There was no Pie in that piezo…. Didn’t I have a Yamaha AG Stomp, that’s specifically designed to handle piezo guitar signals? As I already transferred the WAV file to my laptop, I used Fission to break it the large file up into individual tracks and then ran the signal out the headphone jack of my Apogee Duet (to give the signal a little better sound) and into the Behringer mixer. The Behringer didn’t allow me to run the FX send off of the RCA inputs, so I used a stereo 1/4″ to 2 1/8″ cables to get the signal to the 5/6 channels of the mixer. Since sends are typically mono on units in this price range and the return is stereo, I set up the gain staging of the unit and ran a single cable from the FX Send to the AG Stomp input then ran the stereo send back to the Mixer. I couldn’t get the return blend to sound right in the mixer, so I just ended up going direct from the headphone out of the AS Stomp back into the H2N. I’m guessing that here in our story is where the questions will start. Couldn’t you (I) have just done that in software? Interestingly enough, I tried using the Positive Grid Jam Up Acoustic Sim with a Line 6 Sonic Port and it didn’t hold a candle to the AG Stomp. 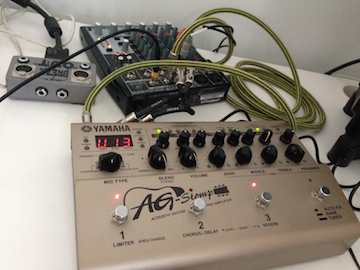 and yes, I probably could have used a plug in like MonoMaker and just run a signal out of the laptop into the AG stomp – but honestly this was just a much easier solution for me. Apparently I had the wrong setting on the Hn2 which recorded the line in AND anything coming through the PA on the mic. This means it was affecting a wierd mix of the direct signal AND a recorded room tone that was recorded BEHIND US sitting on the piano! The short answer is it sounds better than the unaffected file bout would have sounded WAY WAY better if I read the manual and had the H2n on the right setting. As I type this, the audio is still rendering, so I’ll have to post excerpts soon. Oh that might be useful for me later on. This process started at 10am. It’s 12 hours later and I’m still working on it. Mind you, I DID get a few other things done in that time, but it took a number fo false starts to get it together. Had I thought of it, I could have run it through the FX send of the PA and saved myself A LOT of editing and rendering time later. So the lesson I’m really facing here is, do it right the first time because sometimes the cure is just as bad as the ailment! The good news is that the idea is an interesting one, and I may use this approach for additional guitar processing for recording in the future. More photos, clips and other miscellany to come! In the meantime, our website and FB page are in a soft launch – but we’re putting content up pretty regularly now so you should see more things there each day from here on out. This entry was posted in Uncategorized and tagged Farzad Golpayegani, KoriSoron, Korisoron gigs, Korisoron video, Moon and River Cafe, Scott Collins, Yamaha AG-Stomp, ZT acoustic Lunchbox by GuitArchitecture. Bookmark the permalink.